SMF Organizer consists of two parts. "SMF Converter" reads the data from your Secondary Markets Fund statements and saves it in a "database" format. Files saved this way can be used in a variety of databases and spreadsheets. "SMF Organizer" is a database designed specially for Secondary Market Fund data. It's a FileMaker database, but a special runtime version is included so you don't have to own the FileMaker application to make use of SMF Organizer. It has built-in scripts for importing the data saved by SMF Converter. You owe it to yourself to take an active part in tracking your Secondary Markets Fund. Now it’s easier than ever to find the missing payments you deserve. SMF Organizer was created by John Eidsvoog. 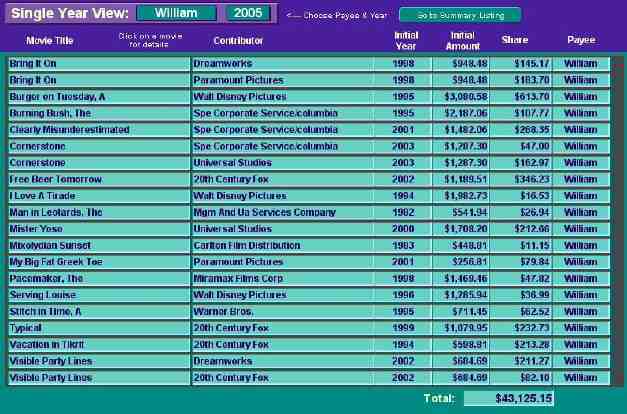 This view lists and totals all payments received for a single movie. 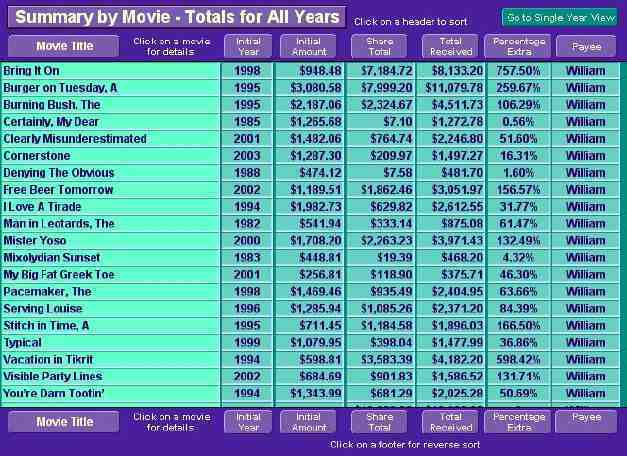 This view shows a list of all movies with totals for each movie. This view lists all payments received for any specific year, with a total.